Bad days, good days…we’ve all had them. Our careers and our personal lives are full of ups and downs. Learning to turn bad days into good days is a key leadership trait. 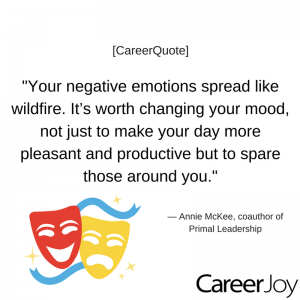 Managing your team’s emotions is the smart way to get the best performance from your team. One of the quickest ways to change your perspective is to go for a short walk. Take a bad start to your day or a challenging conversation and turn it in to a positive moment by simply changing your outlook. P.S. Register to join our next free weekly 45 minute CareerClass Webinar “Ask Alan” on November 29 at 12:00 m EST. Get advice on your current work situation, or options for the future, or insight on whether you are in the right career.